In large bowl, beat butter, 1 1/2 cups powdered sugar, the vanilla and egg with electric mixer on medium speed, or mix with spoon. Stir in flour, baking soda and cream of tartar. Cover; refrigerate 2 to 3 hours or until chilled. Heat oven to 375°F. Divide dough in half. On lightly floured cloth-covered surface, roll each half 1/4 inch thick. 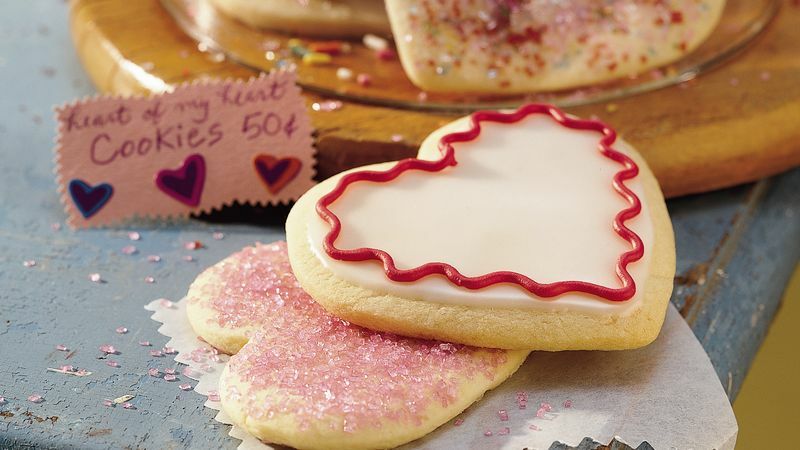 Cut with 3 1/2-inch heart-shaped cookie cutter. On ungreased cookie sheet, place cutouts 2 inches apart. If desired, sprinkle with colored sugars. Bake 8 to 10 minutes or until delicately golden. Remove from cookie sheet to cooling rack. Cool completely, about 30 minutes. In small bowl, mix glaze ingredients until smooth and spreadable. Spread glaze over cookies. Decorate with decorator icings. Short of time? Use a pouch of Betty Crocker® sugar cookie mix instead of the scratch recipe. Cut cookies, using a cutter dipped in flour or powdered sugar, as close together as possible on the rolled dough to avoid rerolling (rerolled dough will be a little tougher).